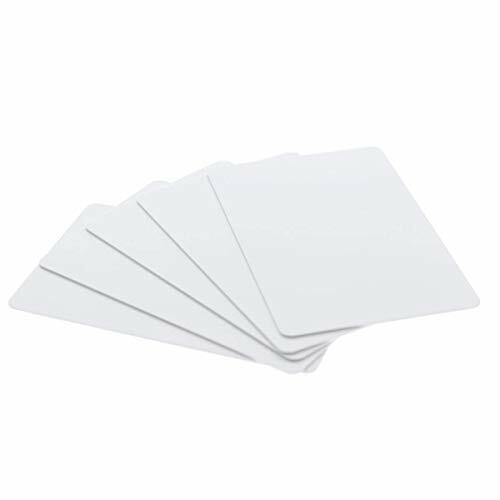 High quality professional grade polished CR80 30Mil Cards (8030) are the prefect choice for all major ID Badge Printers. We ship only shrink-wrapped and brand new. These blank credit card sized replacement badges are perfect for any school, business, church, function, or organization that needs to produce high quality double sided name tags or identification badges that DO NOT require mag strip or prox technologies. These are ideal for student ID's and environments where the badge is inspected visually at a security door or checkpoint. 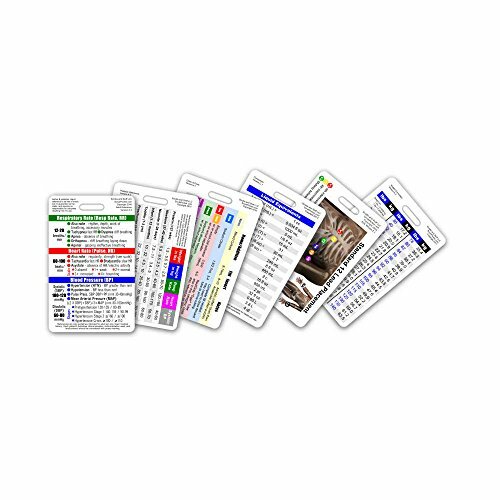 If your HR and Human Resources department is in charge of epmloyee and steaff badging and facility access controls, then these bulk cards will be perfect, they come secured in plastic shrinkwrap sleeves to keep the cards clean and extend the life of your monochrome printer. 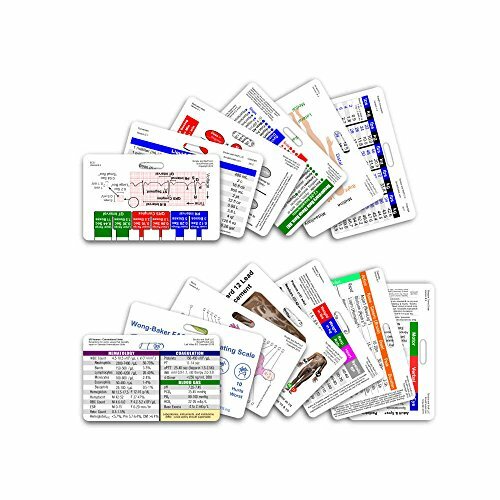 Cards included are as follows (in order of display): Adult Vital Signs Glasgow Coma Scale w/ AMS & Pupil Tool Healthcare Conversion Chart Lab Values Medication Math & Drip Titration Chart Weight Conversion General Range Standard slot pre-punched that will work with badge clips and badge reels. This set comes in both vertical or horizontal format. Purchase whichever version works best for you. Please see our additional listings for other set options. 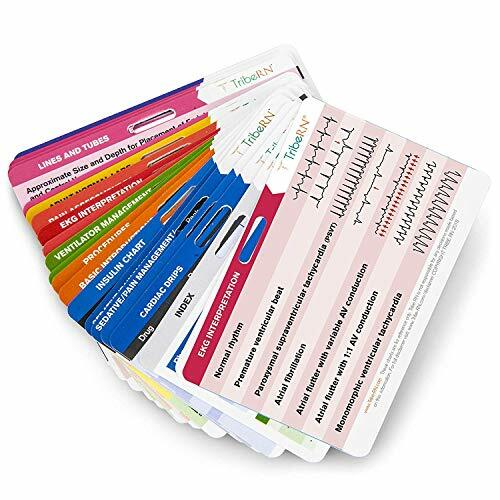 Cards are made of durable plastic, waterproof, and are each about half the thickness of a credit card so it wont weigh down your badge reel or feel bulky. Double sided and uses the entire printable area to maximize the total information. Same as a standard badge ID card (or credit card size; 3 3/8" by 2 1/8"). Cards included:Picture 1Lab ValuesPedi Vital Signs & MilestonesABGs w/ ROMEHealthcare ConversionsAdult Vital SignsWong-Baker FACES Pain Rating Scale w/ Spanish on backMed Math & Drip TitrationTemperature ChartPregnancy "Wheel"12 Lead EKG PlacementEKG Diagram & RulerSTEMI Diagram ToolWallace Rule of 9's & Palmar Method Lund & BrowderBurn Classification & ParklandPicture 2DermatomesHeight & Time ChartHeart Sounds DiagramOrder of Blood DrawCranial NervesGCS ChartFLACCAnatomical DiagramBMI ChartHospital Report & PhoneticsInsulin Pharmacodynamics Wt Conversion General, Adult, PediRASSPlease note - not included are ABA Referral Criteria, Calendar Card, Tidal Volume, ESI, Age Chart, and Blank Make Your Own Versions. We are pleased to be the exclusive provider of Wong-Baker FACES products. Purchasing these products gives you the license to use scale in this product, only. Standard slot pre-punched that will work with badge clips and badge reels. This set comes in both vertical or horizontal format. 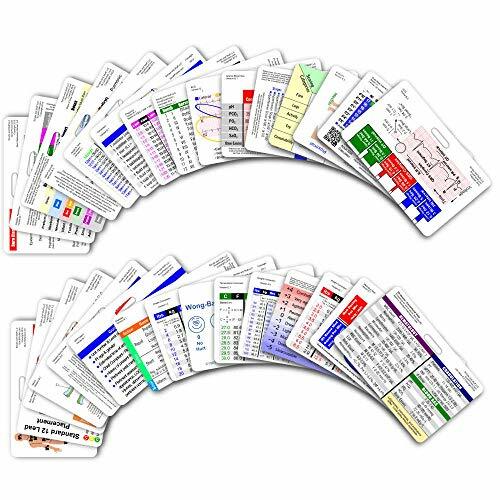 Cards included are as follows (in order of display): Adult Vital Signs Pediatric Vital Signs & Developmental Milestones Order of DrawHealthcare Conversion Chart 12 Lead Placement Diagram Weight Conversion General Range Standard slot pre-punched that will work with badge clips and badge reels. This set comes in both vertical or horizontal format. Purchase whichever version works best for you. Please see our additional listings for other set options. Cards are made of durable plastic, waterproof, and are each about half the thickness of a credit card so it wont weigh down your badge reel or feel bulky. 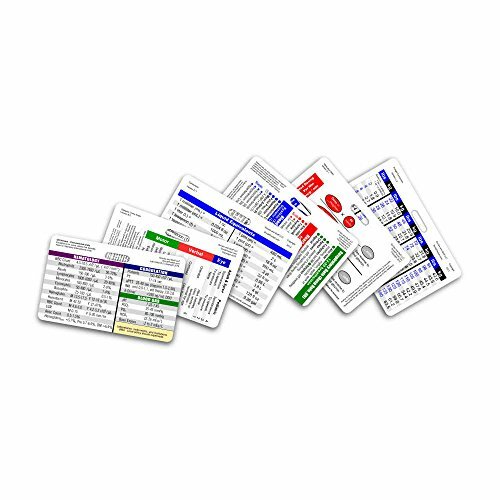 Double sided and uses the entire printable area to maximize the total information. Same as a standard badge ID card (or credit card size; 3 3/8" by 2 1/8"). 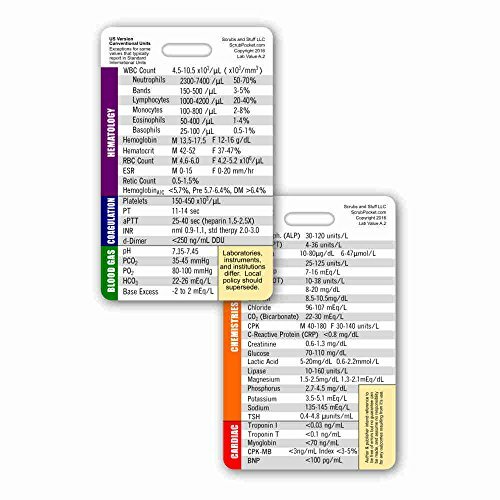 This card gives you the common lab values including Hematology, Coagulation, Blood Gas, Chemestries, and Cardiac Values. 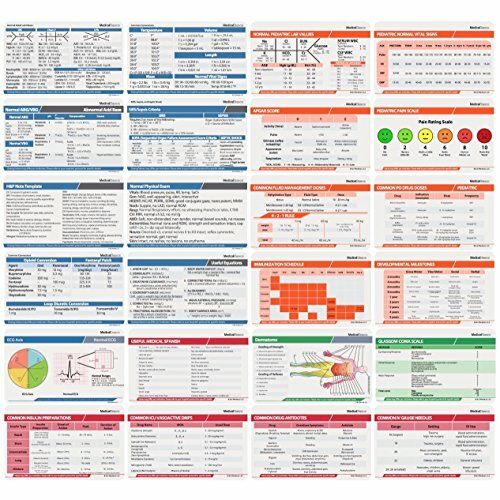 Makes some of these hard to memorize values easily accessible - right at your fingertips! This badge card comes from a series of cards that puts hard to memorize information at your fingertips. It has a standard slot pre-punched that will work with badge clips and badge reels. This card also comes in both vertical or horizontal format. Purchase whichever version works best for you. Card made of durable plastic, is waterproof, and is about half the thickness of a credit card so it wont weigh down your badge reel or feel bulky. 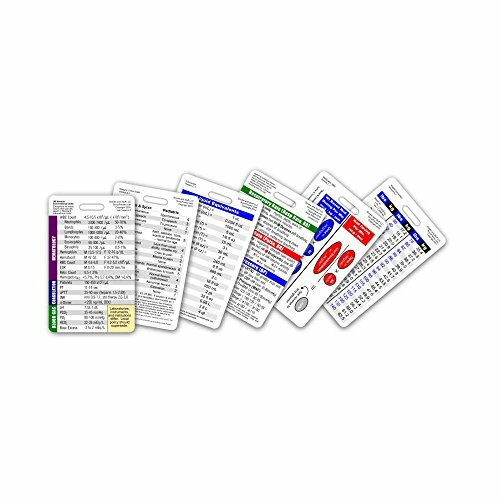 Double sided and uses the entire printable area to maximize the total information. Same as a standard badge ID card (or credit card size; 3 3/8" by 2 1/8"). Shopping Results for "Badge Card"